Sending and receiving large files: It's something we all need to do. Even cloud storage services like Dropbox and Google Drive can't replace the convenience of a quick email. But email poses problems, starting with the strict limits that many ISPs impose on the size of file sent or received. To get the file size down without losing important data, you zip it with compression software. If you're willing to fork over some cash, you can opt for a commercial compression application, such as WinZip or WinRAR. But each sells for about $30. Luckily, these paid applications aren't your only options when it comes to compression tools. There are some fantastic free alternatives out there. Some are even open source. To compare these free alternatives to their commercial cousins, I created a 30MB folder full of PDF files and compressed it with each program. Doing so with WinZip created a 26MB folder—still too big for most email services. WinRAR fared better, compressing the folder down to an impressive 14.3MB, which would get those files through anything but the most draconian mail restrictions. Now let's see how the free alternatives fare. 7-Zip is a well-known open-source alternative to paid compression software. It has earned a large user base, despite its plain (almost dull) interface because it works well—and for most people, that's more than enough to make up for bland design. 7-Zip's 7Z format packs down smaller than the standard ZIP. Although it can use the standard .zip format, 7-Zip touts its own compression format, 7Z, which makes smaller archives. 7-Zip shrank my 30MB folder down to 25.8MB when I opted for the zip format, but compressed that same folder down to 22.1MB in 7Z. 7-Zip offers strong encryption, which includes password-protecting the actual files as well as encrypting the file names. It also integrates into the Windows Explorer right-click menu, so you can immediately compress any file with a click of the mouse. There's even a command line version for those who are more at home in the Windows command box. The downside is the wait time for this relatively small boost: Compressing the folder into a 7Z file took well over two minutes, versus 15 seconds for compressing to ZIP. PeaZip has a lot going for it right out of the gate. It's open-source, it claims to open up to 150 different kinds of compressed files, and it has a portable version that doesn't require installation. True, its interface is a bit plain, but I can forgive that when considering the pros of using PeaZip. PeaZip is a hyper-competent free compression utility. One of PeaZip's best features is its random password generator. Just specify how many characters you want in the password and, with the click of a button, it makes a password for you. Don't like it? Hit the button again and get another one. Additional security features include strong encryption and the ability to securely delete your files. To take advantage of this, just click the "Secure Delete" button in the toolbar, and your files are gone for good. In terms of compression, PeaZip's performance was mixed. It compressed my 30MB folder into a 26MB zip file, just as 7-Zip did. But PeaZip includes additional compression methods—16 in all—and includes the ability to split the file up into different pieces. You can specify your own file size for each piece, or choose one of the pre-set sizes. For example, if you wanted to email a 30MB folder, you could split it up into two chunks, one of them 24.5MB and the other one 1.5MB, and send them separately. However, the person at the other end would need the PeaZip software to put it all back together again. Hamster Free Zip Archiver makes a great first impression, especially compared to all-business 7-Zip and PeaZip, thanks to its attactive user interface and a bouncy GIF animation. From the start, Hamster feels fresh and new, a pleasure to look at and use. Among compression utilities, Hamster Free Zip Archiver is a real looker. It's easy to use, too. To create a compressed file, you simply drag-and-drop the files you want to include onto HFZA main screen. Hamster tells you the folder's current size and asks you to choose between the ZIP and 7Z formats. Choose your file format, whether or not you want to split the file, and whether or not you want to lock the file. You then press "compress," and Hamster does its job. Hamster Free Zip Archiver is fast. The Hamster Soft website claims that the program takes advantage of multi-core computing, and the results I got testing Hamster on a new Windows 8 PC Quad-Core supports that assertion. The company claims to best competitors on older machines, too. Hamster reduced my folder to the usual 26MB file, so there is no extra advantage. But, like PeaZip, Hamster offers the ability to split compressed files and let your recipient reassemble them. Another downside to Hamster Free Zip Archiver is that the company's support team did not answer my many emails. For tech support, you might as well consult your hamster. Universal Extractor is extremely useful for opening archives, but it does have a limitation if you want to create an archive. And that limitation is severe: UniExtractor can't create anything. 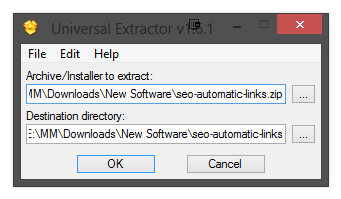 As its name implies, UniExtractor only extracts. But despite this limitation, it is a neat little app to have. Universal Extractor decompresses everything, compresses nothing. UniExtractor lives in your Windows right-click menu, waiting for compressed files that need opening. The user-interface (such as it is) is spartan, with a tiny box and few preferences to select. But Universal Extractor isn't getting by on its looks. It's surviving on its functionality. It claims to be able to open any type of compressed file available. Whether it's a ZIP, a RAR, a TAR or a JAR, UniExtractor claims to be able to handle it with ease...and it did manage all of the files I threw at it. If you need to only open compressed files (and not create them), UniExtractor is the only software you'll ever need. That said, Universal Extractor's developer gives no precise information about what versions of Windows the software runs on. In my tests, it worked well on Windows 7 and Windows 8 desktop. For anything less than Windows 7, you'll have to make your backups and try your luck. ZipItFree knows when to stay out of the way. You can roll this compression software's UI into its top bar, minimizing it screen space without closing it entirely. When you need ZipItFree again, just click the button and the interface drops down, just like window blinds. ZipItFree may not look great with its default skin...but hey, you can roll it up when you're not using it. That design sense doesn't extend to the software's default burnished steel skin, which is, frankly, ugly. Fortunately, ZipItFree comes with Vista and Windows 7 design skins as well, and either is an improvement. ZipItFree gets a lot right. It features strong encryption, support for 15 compression formats, and, like PeaZip, the ability to split up the file into multiple chunks of a set size to make it easier to send, or to burn onto portable media. For example, it can make an exact size to fit onto a 700MB CD disk or a 4GB DVD disk. You can also attach comments to your archives, letting you make more than a filename's worth of notes about the contents. ZipItFree performed very fast on my 30MB folder, nearing its promised maximum 40 percent time reduction. It compressed the folder down to 20MB. However, watch out for the extra software that ZipItFree tries to make you install. Pay attention and uncheck the boxes for anything you don't want. Having compression software on your PC is a must. If money were no object, I would opt for WinRAR, as its compression abilities are very impressive. But, when considering only the free options, I'd choose PeaZip, thanks to its strong security features and impressive compression options. I'd also keep Universal Extractor on hand for opening those rarer compression formats. For occasional compression, the free alternatives hold their own against the paid stalwarts—especially when you consider features such as secure deletion, strong encryption, and the ability to send files by chopping them up into sizes of your choosing. 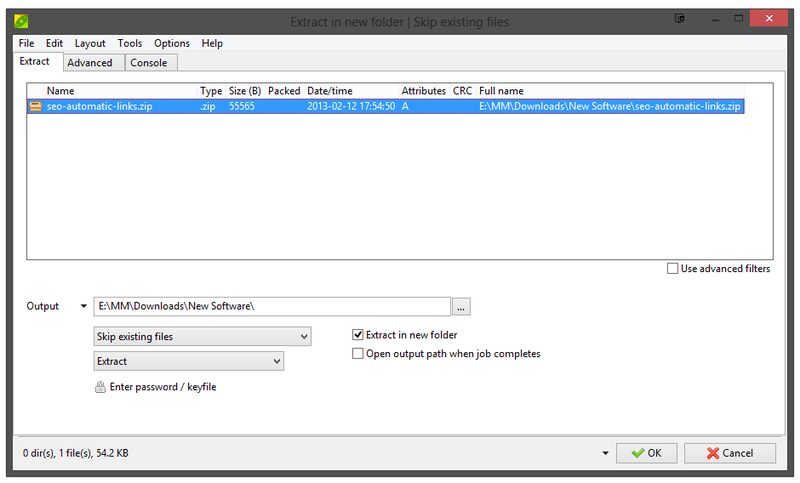 Create ZIP compressed archives for free on your 64-bit OS with this handy utility. Create ZIP compressed archives for free with this handy utility. You won't find an easier, more capable compressed archive utility, though performance could be better on some file types. Drag and drop your files to either open a compressed file or to make one. Feels faster than some of its rivals. With support for almost any archive file out there, this app makes all others redundant—but its lack of support and inability to make archives hold it back. With efficient compression and encryption, this free utility is a winner.